A large scale redevelopment of the bus station in Rotherham town centre looks unlikely as partners instead focus on refurbishing the car park which is "nearing the point of being beyond economic repair." The town's bus station also includes a retail development covering 55,000 sq ft and consisting of 18 units. Opened in 1971, the multi storey car park on the site has since developed widespread defects and the existing tight spaces and drab appearance mean that occupancy levels only average approximately one third of its 678 capacity. 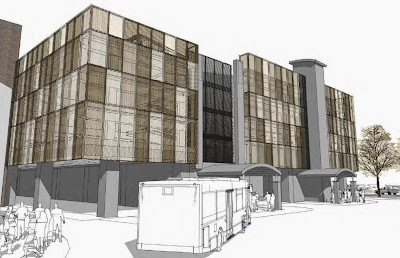 Plans were approved in 2014 for the detailed design of the renovation and re-cladding of the four-storey car park. However, the start date of the refurbishment was delayed following a decision to further investigate alternative development options on the site. Talks have been ongoing between the operators, the SYPTE, Rotherham Council and owners Norseman Holdings on which option to take. A cinema and new interchange scheme proposal was developed but the funding to deliver the scheme could not be sourced. The issue has been complicated by a fire at the site in May which caused significant damage to the interior of the interchange and pushed the overall repair bill above £5m. Steve Edwards, executive director of the South Yorkshire Passenger Transport Executive (SYPTE) told a recent meeting of the Sheffield City Region Combined Authority Transport Committee: "We have been looking at the longer term future of the car park and the interchange with a number of options being considered, ranging from a redevelopment of the location, to a repair and update of the infrastructure. "The proposal at the moment is to go for the latter option - to repair and refurbish the car park and interchange. This will go to the combined authority for formal approval in due course. "Both activities will cause some disruption whilst that work goes ahead and we are working on a plan to coordinate those activities together so we cause as little disruption as possible to the travelling public." £3m from the reserves of South Yorkshire's transport budget has already been put aside for the works. The recently published draft capital strategy from Rotherham Council included an ambition to invest in "Improvements to the Transport Interchange, to address current condition and public safety issues. The aim is to create a new, brighter, safer environment and address some of the issues around CSE in and around the existing Interchange." Only 15% of school pupils responding to the Borough Wide Lifestyle Survey said they feel safe at the bus station. 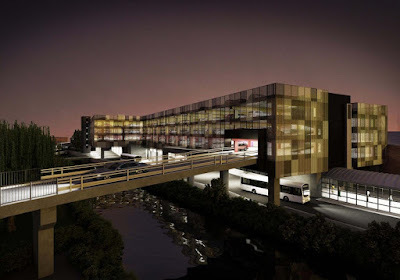 Architectural firm, Aedas, who also designed Rotherham's revamped train station, developed the "elegant solution" for the building's drab appearance by using exterior panels featuring three tones of brown and gold that mimic the colour of iron before it has been manufactured into steel. The anodised material is expected to "softly shimmer as the sunlight is cast upon it." Also part of the approved plans, the existing four bay parking layout will be replaced with a three bay parking layout. This is designed to free up significant space for manoeuvring, as well as allowing people to get in and out of their vehicle with greater ease. However, this will result in the number of parking spaces reducing down to 485. The plans propose to introduce "an abundance of colour" on the car park floors and as part of the internal refurbishment there is the opportunity to clarify the layout by introducing markings for pedestrian zones, improving signage, enhancing space markings, and clarifying road markings. Talk about drab! The new colours they are planning of dull brown and gold wots that all about? The architecture of Mosques are gold! The colours should be planned abit more better with the folks of Rotherham having a say. After all it's Rotherham folk that will have to live with the colour of the cheaply refurbished bus station. Actually, I think this is quite a positive step. There's been all sorts of rumours flying around about the possible closure of the bus station and confirmation that the site is going to be redeveloped (albeit a facelift) might be a step in the right direction. Let's hope they do a better job than Rotherham central, after barely four years since opening the white roof panels are already turning brown not to mention it leaks !